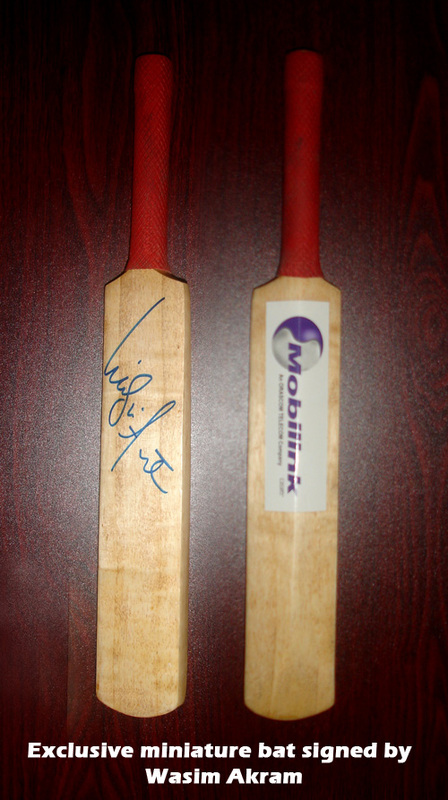 With T20 fever in full swing, Mobilink Jazz is giving away cricket bats signed by Wasim Akram & Shahid Afridi! Now that is something cricket buff out there would want to get their hands on. Well hurry up, cos they are giving out 20 bats. In order to enter the lucky draw for these giveaways, all one needs to do is answer a simple question that tests your T20 Cric-IQ. To participate, join SimplyMobilink page on Facebook and click on the Cric-IQ tab. The contest ends on 16th of May. All correct entries will be included in the lucky draw and names of 20 lucky winners will be announced on SimplyMobilink Facebook page on 19th of May. Mobilink is the official cellular phone company of Pakistan Cricket Board. Mobilink Jazz is always at the forefront to bring something exciting for cricket fans all across the nation. From introducing interesting value added services like cricket alerts, match schedules, live commentary, and latest video clips of wickets to giving cricket lovers a chance to meet cricket legends like Wasim Akram, Shahid Afridi and Muhammad Razzaq, Mobilink Jazz remains on top to cater to the ultimate cricket fervor in Pakistan.